Living near the remote and rugged outback town of Marree, Lynn has made her home in one of Australia’s most isolated regions. But, although she’s in such a hard-to-get-to place, Lynn’s heart has been easy to reach for Jesus! When PIM Patrol David and Gae McDonald first met Lynn, she was very open to conversation and welcomed the chance to receive prayer. Concerned that Lynn was being drawn to New Age spirituality, David and Gae took time to share the Good News with her – and to introduce her to biblical truth. “We gave her devotional material, and encouraged her to get an easy-to-read Bible,” says Gae. Thanks to the commitment of friends like you, David and Gae were able to take the long drive out to Lynn’s station a few months later – fervently praying for the Lord to be at work in her life. They arrived to find their prayers answered! In the months that followed, David and Gae built a deeper relationship with Lynn – discipling her in her new-found faith. 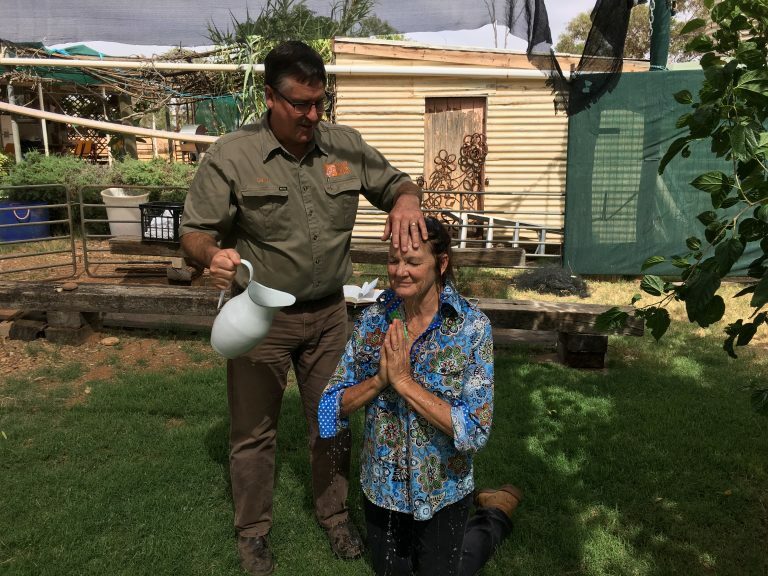 “Not long after that, David baptised her in the name of the Lord at her station in the outback,” Gae says, smiling. It’s only through your partnership that people like Lynn can receive the spiritual care and counsel they so desperately need. Without David and Gae, Lynn would’ve had to take a five-hour journey to meet with the nearest pastor. And the closest group of believers meeting for fellowship is a 3.5-hour drive away. Your prayerful support means that PIM teams are resourced and equipped to make contacts, share the Gospel, and build deep life-changing relationships with men and women beyond the reach of mainstream churches. Thank you for going the extra mile for the sake of people like Lynn who are searching and spiritually-hungry. God is using you to share the hope of Jesus – transforming lives now and for eternity!